Ex Army, retired cop and former scenes of crime officer. Colin Campbell served with the West Yorkshire Police for 30 years. He is the author of UK crime novels, Blue Knight White Cross and Northern Ex, and US thrillers Jamaica Plain and Montecito Heights featuring rogue Yorkshire cop Jim Grant. 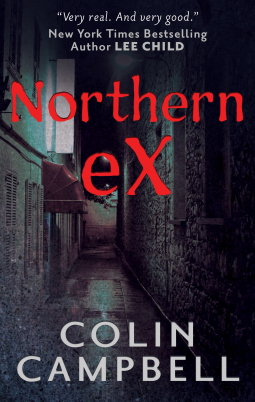 Northern Ex is a terrific crime thriller told from the point of view of a discharged police detective who is obsessed with massage parlors that he worked in as part of the vice squad, but now haunts on a regular basis. It opens slowly as the details of McNulty's massage are set out step by step, but don't think that it is a slow read. This book is not just well-written, but well-paced, building to a crescendo by the end. That's because McNulty is not the only one obsessed with the massage parlors and someone else is making the women and teenage girls disappear, often on a permanent basis. It has all kinds of great themes like the cop who is always a cop even if he was dismissed from the force, the loneliness of McNulty as he struggles with who he now is without his badge, his determination to the right thing, and of course the theme of the innocent man on the run with all the evidence pointing towards him. Some British thrillers are hard to access for an American audience, but not this one. It was quite easy to dive into and Campbell is one of those authors who probably should be more well known than he is.